[162 Pages Report] The carbon nanotubes market is estimated to grow from USD 3.95 billion in 2017 to USD 9.84 billion by 2023, at a CAGR of 16.70% during the forecast period. In this study, 2017 has been considered as the base year to estimate the size of the carbon nanotubes market. The report provides the forecast from 2018 to 2023. It aims at estimating the size and growth potential of the carbon nanotubes market across different segments, such as type, method, application, and region. Factors such as drivers, restraints, opportunities, and challenges influencing the growth of the carbon nanotubes market have also been studied in this report. The report analyzes the opportunities in the carbon nanotubes market for stakeholders and presents a competitive landscape of the market. The top-down and bottom-up approaches were used to estimate and validate the size of the carbon nanotubes market and to estimate the sizes of various other dependent submarkets. This research study involves the extensive use of secondary sources, directories, and databases, such as Hoovers, Bloomberg, Chemical Weekly, Factiva, and other government associations. Moreover, private websites and company websites were also used to identify and collect information useful for this technical, market-oriented, and commercial study on the carbon nanotubes market. After arriving at the total market size, the overall market was split into several segments and subsegments. 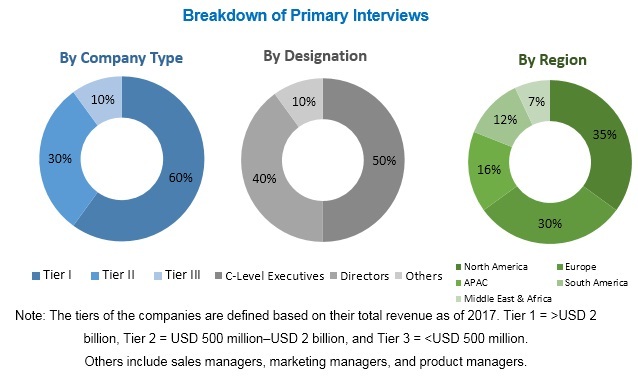 The figure given below provides the breakdown of the primaries conducted during the research study, based on company type, designation, and region. The growth of the carbon nanotubes market is affected by the cost structure of carbon nanotubes, processing difficulties, and availability of substitutes such as silicon carbide nanotubes (SiCNTs). The methods which are used to produce carbon nanotubes, such as arc-discharge and laser ablation methods, are expensive, hazardous for nature, and uneconomical for the production of carbon nanotubes on a large scale. In 2015, Cnano Technology Limited (US) completed its USD 15-million funding which they will use to expand its manufacturing plant in Zhenjiang, Jiangsu, China. This will help the company to cater to the increasing demand for their products in the region. In 2015, Nanocyl S.A. (Belgium) launched ELASTOCYL HTV1001, a multi-walled carbon nanotube. The new product is a trade name of Nanocyl for high-performance applications. In 2015, Nano-C Inc. signed an agreement with IRRESISTIBLE MATERIALS Ltd (UK) for the manufacture of carbon-based materials and chemicals for electronics. Furthermore, these materials will be supplied by MicroChem Corp. (US). In 2015, Nano-C Inc. (U.S.) launched NC7000 multiwall carbon nanotubes product. This product will be used in buildings & construction application. In 2016, Continental Carbon Company (US) Kemya (Saudi Arabia), a joint venture between Sabic and ExxonMobil. Continental Carbon Co. has started a 50-kilotons per year carbon black plant in Al-Jubail, Saudi Arabia. The company aims to capture the growing demand for carbon nanotubes in the tire industry in Europe and the Middle East & Africa. In 2016, Ocsial (US) entered into a purchase and marketing agreement with the Chinese carbon nanotube raw material suppliers Nanjing Leiqi. With this partnership, the company aims to tap the growing demand for carbon nanotubes in composites and flooring industries in China and other neighbor nations. This research report categorizes the carbon nanotubes market based on type, method, application, and region. What are new application areas which the carbon nanotubes companies are exploring? Are there any new methods of manufacturing carbon nanotubes? Could you mention the major companies? The carbon nanotubes market is estimated to grow from USD 4.55 billion in 2018 to USD 9.84 billion by 2023, at a CAGR 16.70%. The demand for carbon nanotubes has been increasing rapidly in applications such as field emission displays, integrated circuits, hydrogen storage, lithium batteries, solar PV cells, fuel cells, and drug delivery. Increasing commercialization; ramping up of installed capacities; and technological advancements to bring down prices, improve quality, and develop more advanced products are the trends in the carbon nanotubes market. Currently, R&D is being undertaken for capturing new applications, including food materials, glass ceramic, structural steel, agriculture, and hair color. The constant increase in the feasibility of potential applications for carbon nanotubes will keep the demand ticking upward during the forecast period. The carbon nanotubes market is segmented on the basis of on multi-walled and single-walled carbon nanotubes. The multi-walled carbon nanotube segment is expected to grow at a higher CAGR in terms of value during the forecast period from 2018 to 2023. MWCNTs are used in applications such as electrical conductivity, conductive transparent electrodes, conductive heating films, conductive nano inks, nanodevices, displays, chemical sensors, super batteries, supercapacitors, energy storages, solar industries, and thermal interface material. They are highly conductive when properly integrated into a composite structure. Only the outer walls of MWNTs are conductive, not the inner ones. The carbon nanotubes market is segmented based on method into chemical vapor deposition (CVD), catalytic chemical vapor deposition (CCVD), and high pressure carbon monoxide reaction (HiPCO), among others. The CVD segment is expected to grow at the highest CAGR during the forecast period. It is the largest and fastest-growing method segment globally. CVD of hydrocarbons over a metal catalyst is a classical method that has been used by various manufacturers to produce carbon nanotube. It is also the cheaper method, and it is expected that the price will further go down globally. The carbon nanotubes market is segmented based on application into electronics & semiconductor, advanced materials, chemical & polymers, batteries & capacitors, energy, aerospace & defense, medical, and others. The electronics & semiconductor segment is expected to grow at the highest CAGR during the forecast period. Carbon nanotubes offer unique electrical properties for building electronic devices such as field effect transistors and diodes. These are also used to form a p–n junction diode by polymer coating and chemical doping. Furthermore, carbon nanotube-based diodes can potentially disperse heat out of the computer chips due to their unique thermal transmission properties. The APAC carbon nanotubes market is expected to grow at the highest CAGR during the forecast period, which can be attributed to the rising demand for carbon nanotubes from India, China, South Korea, Vietnam, Taiwan, and Singapore. The robust demand in the region is the major driving factor for the global carbon nanotubes market. China will lead the demand for carbon nanotubes due to its increased industrial production. It is also among the largest consumers of carbon nanotubes at the global level. Aerospace & defense industry is estimated to drive the carbon nanotubes market in terms of value. Due to the risks involved in flying, aircraft manufacturers are striving to make the aerospace components stronger, tougher, and longer lasting. The industry is also seeking to reduce weight in an on-going bid to reduce fuel consumption and, by extension, operating costs. Nanomaterials are utilized in the aerospace industry for improved (or tailored) properties that improve their functional performance (e.g., mechanical or electrical properties) or that deliver multi-functional properties (e.g., lightweight conductive nanocomposites). The bulk of R&D into aerospace applications of nanomaterials at present focuses on structural reinforcement of composite materials. The recent surge in the electronics industry, particularly in semiconductors and printed circuit boards (PCBs), has resulted in the increased use of carbon nanotubes, globally. The outlook of the electronics & semiconductors industry is positive in the near future with high potential for product innovation. Carbon nanotubes have excellent mechanical and electronic properties, thereby making them extremely attractive for new generation electronics applications. The growing demand for coating resins from the building and construction industry is one of the key factors anticipated to fuel the growth of the Asia Pacific coating resins market in the next few years. Some of the coating manufacturers include Akzo Nobel Coatings N.V. (Netherland), PPG Industries Inc. (US), Sherwin-Williams Co. (US), and DuPont Coatings & Color Technologies Group (US). The filter manufacturers include International Business Machines Corporation (US), Eastman Kodak Company (US), Samsung Electronics (South Korea), and Panasonic Corporation (South Korea). Carbon-nanotubes, with distinct 1D-tubular structure, excellent electrical and thermal conductivities, mechanical flexibility, and significantly large surface-area, are considered best nanomaterials to enhance lithium batteries performance. Lithium batteries are expected to have the highest market share during the forecast period. The demand for lithium-ion batteries is rapidly increasing in vehicles that require lightweight and high-energy density solutions. These batteries provide the highest energy density per weight and also used in cellular phones, notebook computers, and hybrid automobiles. OEMs have to adopt batteries which have high capacities and are also light in weight that provides them with the leanest production process and also reduces CO2 emissions. What are the expected mid- to long-term impact of these developments on the industry?? What are the upcoming applications of carbon nanotubes? Increasing concerns over the environmental impact of carbon nanotubes have led to stringent regulatory constraints for carbon nanotubes manufacturers. High risk is identified for human beings and the environment from carbon nanotubes agglomerates. The toxicity of carbon nanotubes may affect human health, including increased risk of high blood pressure and kidney damage. Carbon nanotubes are fibrous in nature and may cause some health problems if inhaled. The general public faces exposure to nanoparticles and nanomaterials from a number of products containing nanoparticles available in the market, such as paints and varnishes, cosmetics, advanced textiles, fuel catalysts, specialist automotive and aerospace components such as airframe, body parts, and combat jackets. As manufacturers of nanomaterials are increasing production capacities, more nanoparticles are released into the environment. Hence, exposure of the general public to nanomaterials is rapidly increasing. 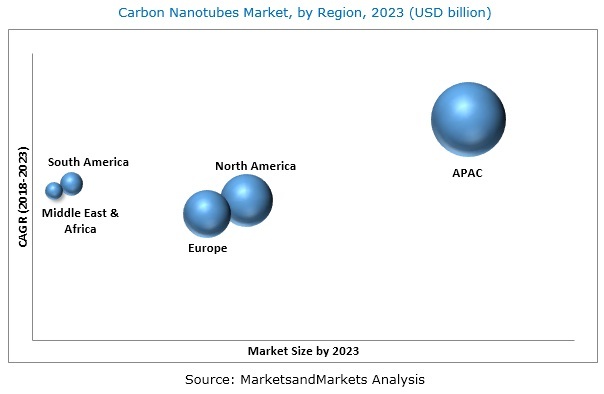 Key players operating in the carbon nanotubes market include Arkema S.A. (France), Arry International Group LTD. (China), Carbon Solutions Inc. (US), Cheap Tubes Inc. (US), CNT Co., Ltd. (Korea), Ocsial Llc (US), Hanwha Chemical Corp. (South Korea), Nano-C Inc. (US), Cnano Technology Ltd (US), Toray International Group Limited (Japan), Showa Denko K.K. (Japan), and Continental Carbon Company (US). 12.12.1 Kumho Petrochemical Co., Ltd.
12.12.3 Chengdu Organic Chemicals Co. Ltd.
12.12.10 Chasm Advanced Materials, Inc.